Here's a fast, smooth, all machine language adaptation of a classic arcade game. With the modifications included below, it runs on any IBM PC (color/ graphics or monochrome adapter) with at least 64K RAM and a disk drive, and any Enhanced Model PCjr. 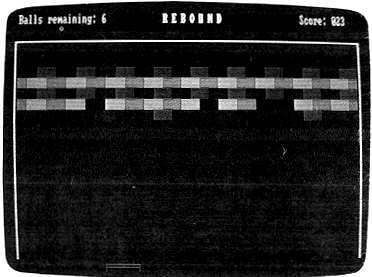 "Rebound" takes advantage of machine language to streamline the action in this arcade-style game patterned after the popular Breakout. By controlling a paddle at the bottom of the screen, your goal is to knock out all the bricks at the top of the screen with a bouncing ball. Unlike most action games, Rebound works on all three popular types of IBM Personal Computers. Program 1 is for an IBM PC with the color/graphics adapter. Program 2 consists of modifications to make Program 1 work on an IBM PC with the monochrome adapter. And although Program 1 works as is on an IBM PCjr, the modifications contained in Program 3 accelerate the game to compensate for junior's slower execution speed. If you have a color/graphics PC, type in Program 1. If you have a monochrome PC, type in Program 1 and substitute the lines in Program 2. If you have a PCjr, type in Program 1 and substitute the lines in Program 3. To be safe, save the program on disk before running it for the first time. Next, insert a disk in drive A and type RUN. The BASIC program will create a machine language file on disk with the filename REBOUND.EXE (the drive may whir on and off a few times as the file is created). When the Ok prompt reappears, exit BASIC to DOS by typing SYSTEM. Make sure the disk with the REBOUND.EXE file is in drive A. To run Rebound, type REBOUND.EXE at the DOS prompt. Almost instantly, the game screen will appear. To start playing Rebound, press the Enter key. The first ball starts moving downward from the middle of the screen. Your job is to keep it from falling off the bottom of the screen by bouncing it upward toward the rows of bricks. To bounce the ball, move the paddle back and forth with the left and right Shift keys. You'll have to anticipate where the ball will bounce next, because the paddle can't always move across the screen as fast as the ball can (otherwise the game would be too easy). If you miss a ball, another one starts falling. You get a total of eight balls before the game ends in defeat. If you succeed in knocking out all the bricks, the program resets for another game. There are five rows of bricks. Bricks on the lowest row are worth one point each, bricks on the second-lowest row are worth two points, etc. You can freeze Rebound at any time by pressing the space bar. Press any other key to resume play. nearly all IBM Personal Computers. The Esc key restarts a game in progress by replacing all missing bricks and lost balls. It also resets the score to zero. To stop the game entirely and exit to DOS, press Ctrl-Break on the PC or Function-Break (Fn-B) on the PCjr. Refer to "COMPUTE! 's Guide To Typing In Programs" article before typing these programs in.